If you have chosen a cremation funeral for your loved one, you may need to choose an urn for their ashes. Funeral urns come in a variety of shapes and sizes and they can be made from different materials depending on what you are looking for. Your funeral director can help you source the perfect one. Here’s a look at some of the things to consider when you’re choosing a funeral urn. Do you have to have an urn for cremation ashes? You don’t have to buy an urn for cremation. You might choose to scatter the ashes from a decorative scattering tube, or have a memorial jewellery piece or keepsake made with your loved one’s ashes, instead. After a cremation, the crematorium will prepare the funeral ashes for collection in a polythene bag, usually placed inside a plain cardboard box or tube. You may be provided with a very plain plastic urn, at a small cost. Very simple cremation boxes for ashes can be also be an option, if you are planning on scattering the ashes of your loved one somewhere special. 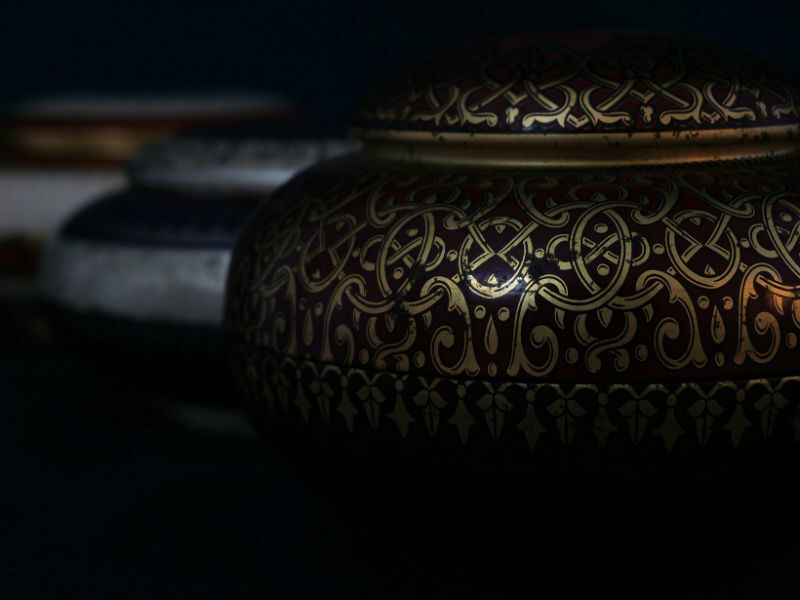 If you want something more appealing for display, or you have specific desires to bury or display the ashes, it’s worth looking at the different choice of urn. If you’re looking for traditional funeral urns, the choice is large and covers a wide range of budgets. The best material for an urn depends on whether you want to keep the ashes, scatter them, or if you want to bury them. If you are keeping and displaying your loved one’s ashes at home or in a columbarium, then a decorative urn may be appropriate. If you plan on scattering or burying the ashes, then the look might not be as important as whether it’s biodegradable or will stand the test of time. Wood, stone and metal urns for display or burial are all available in attractive designs and personalised to reflect your loved one. If you are looking for something personalised, look out for customised and creative urns from artisan makers and specialist studios, in some amazing designs. What type of urns can be buried? Any type of urn can be buried, but if you want it to return to nature, you need to pick the right material. Biodegradable options have been around for some time now and there is a lot of variety to choose from. A popular option for eco-friendly cremation urns suitable for burial are those made from recycled paper, and containing a sapling or tree seed. The cremation ashes are combined with a growing mixture and can be planted somewhere as a memorial tree. If you are planning on more permanent display of your loved ones ashes then there are materials that won’t biodegrade and can last for generations to come. For storing in a columbarium or a place close to your heart, a treated wood, stone or metal urn might be the best choice. Even glass urns can be created to reflect the character of your loved one and will last for many decades. There’s a huge variety of materials, styles and types of urn available. Apart from traditional urn-shaped containers, you can buy urns designed to look like sculptures, made of glass, or with a personalised design. The majority of cremations result in roughly the same amount of ashes, so what you really need to consider is whether the urn needs to hold a single person’s cremation ashes or whether it will eventually hold two people’s ashes or more. Couple’s urns or family urns are available to buy, are larger, and can even have multiple separate compartments inside. You can also find smaller and beautiful keepsake urns, especially made to hold a child or baby’s ashes. How much ashes do you get from a cremation? Around two to three kilos of ashes are produced when an adult is cremated. Most cremation urns hold between three and four litres of cremains and tend to be standard for a single person’s ashes. If you’re planning on transporting your loved on to a location to be buried or scattered, you may want to consider a simpler urn. You could also opt for a number of smaller keepsake urns for human ashes if several loved ones or family members wanted to keep a portion of the ashes. Glass paperweights, pendants and other jewellery, are another way to keep a loved one’s ashes. Smaller urns or ashes into glass keepsakes are also perfect, if you plan on scattering the ashes somewhere of sentimental importance, but want to keep some close by as well. Your funeral director can help you choose the perfect funeral ashes urn for your loved one. They will also tell you about how and when your loved one’s ashes will be ready for you take home or scatter – or about arranging for your loved one’s urn to be interred in burial plot at a traditional cemetery or natural burial ground.